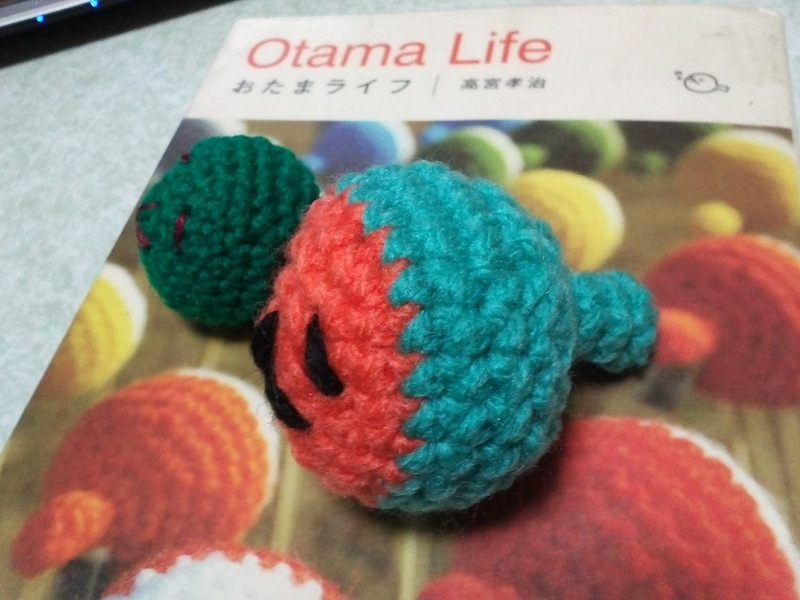 Tonight I knit these Otamas after Miyu fell asleep. They are so sweet (* v *)!!!! Several years ago, the writer of the book had a web site on which I could find the chart of Otama. When I wanted to knit them again, I found the site had gone already. Fortunately I found the book in the library yesterday. Miyu will like them because she likes tadpoles very much. I'd like to knit them more and make Miyu laugh (* v *)!!!! I like knit fabric sewing lately. 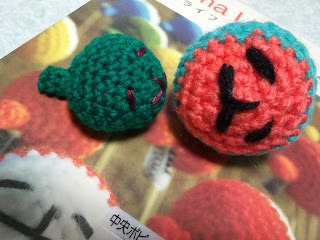 So I made some Yo-Yos using my favorite knit fabrics. 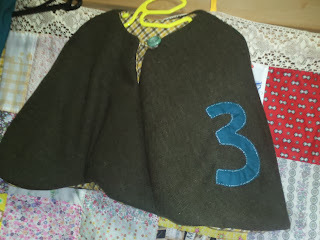 It's very easy to sew and needs little piece of fabrics. I'd like to show you how I made it. First I cut 3-inch diameter circles. I need 4 Yo-Yos for a bracelet. Then I made Yo-Yos with them and put my favorite buttons on them. I made a patchwork cord on which I put Yo-Yos. And I put a button on the end of the cord and made a loop on the other end. The gray fabric is sweat and the other one is Jacquard knit. I also made my neck warmer, my husband's and Miyu's with the sweat fabric(* v *). They make us very warm in this cold house. Last night I made Miyu a pair of new leggings. It's from a Japanese pattern book. It has lots of cute patterns for girls. It took only an hour for me to sew it. It's quite simple and good pattern. She likes my handmade clothings and often asks me to sew her ones. For Halloween, I made her a cape. Her request was the "3", because she's three years old. She is so comfortable in it and wears it almost everyday with a small ghost brooch (* v *). At a Halloween party, she put it and a cap (I put a face of her favorite Jack-o'-Lantern). She walked around and got lots of candies. We enjoyed Halloween very much this year. When I was a girl, the event isn't so popular in Japan and I didn't know it. Now, it's very popular and we could enjoy some events. So Miyu could get lots of candies (* v *). Last week I got her two T-shirts and embellished one of them for the Halloween event. She was very delighted with it because she likes Jack-o'-Lantern very much. She puts it on whenever she finds it washed. At the back I put a big bow. Today I put a cup shaped pocket on the other one. She likes orange juice so I made the straw in orange. At the back I put big candies because she likes candies very much. I enjoy sewing items for Miyu and happily she likes them. But sometimes she asks me to make something I cannot make. She wants batteries for my husband bicycle, a new chair, new games etc... She believes I can make everything (* v *). I'm a very happy mother. I haven't written in so long. Miyu is now 3 years old and doing very well. I've made lots of her clothes and these pants are my favorite ones. These pants are very comfortable, easy to move in and easy to sew. So my husband advised me to sew them for my ETSY shop. I've made three ones already. Now I'm preparing restart my shop again. I'm always playing with Miyu and have little time for myself. But she goes to bed earlier than before because she doesn't take a nap recently. So I can use several hours a day for myself and my shop. Thank you very much for your kind comments and e-mails for us. I'd like to post a recipe of making these pants as soon as possible. These are what I sewed for Miyu recently. Miyu is very good at drawing. So I appliqued one of her drawings on her shirt, a cute dog. Now she likes me sewing by her ! (* v *)!. See you!!! !